On August 21, 1998, Anaït lost her battle against cancer, her family lost a wife and mother, and some of us lost a valued friend. On the basis of her pioneering work alone, Anaït should have received more accolades in her lifetime than she did. 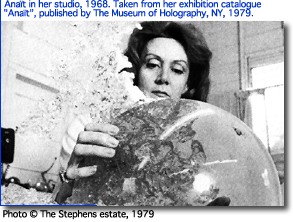 As a sculptor and installation artist, she began her work in reflection holography in 1971, and in 1976 she held the first art exhibition of reflection holograms, which toured for three years in art venues. She exhibited her work successfully in art galleries and museums, as well as in major holography exhibitions world-wide. Anaït wasn't always completely popular, but she contributed ideas, imagination, joi-de-vivre, humour and enthusiasm about art and holography over many years. In my opinion her "Aurora" and "Water Lilies - after Monet, or Slow Death" are amongst the very best art work made using holography. These are large scale works, but the soft, sometimes child-like, "hands-on" quality of her small scale work is also uniquely hers. 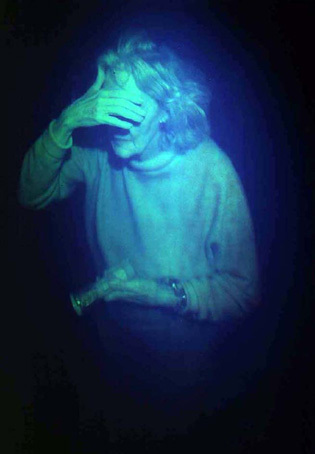 Her work has been misunderstood by many holographers. Anaït persisted in making dim holograms. This is for the same reason that she lit her work with floodlights instead of narrow beams. She thought that we should be more tolerant of such criteria. Similarly in her 'instant' approach to making holograms she has insisted on using a holographic set-up that has almost the immediacy of a Polaroid camera, and up until the last three years she made most of her holograms herself. In consequence she has been looked down on by those who put technical excellence high on the agenda. In her last years she gave away her equipment, and collaborated instead, carrying out some full colour pieces, which include a hand-painted flag, with Hans Bjelkhagen. Her piece Question (Is It Art Yet?!) says much about Anaït. She even went to the lengths of inventing a pseudonym (Augé Darr) for some of her work, in her attempt to circumvent some of the prejudice against her work. Her twenty seven year involvement with the medium should have received more recognition whilst she was still alive, in both art and holography circles. It is very sad that by the time she received a Lifetime Achievement Award at the Art and Holography2 Symposium in 1996, she was not able to recognise the acknowledgement of her peers as genuine. During 1997 she worked with Richard Bruck, at his pulsed laser studio in Chicago, to produce a number of experiments using figurative compositions.